Expert tip: This is one of the most popular yoga retreats offered in Austria. Want to let go, have fun & recharge energy in winter wonderland? Our globeseekers Snow Retreats in the beautiful Austrian mountains are a mix of snow activities, a variety of Yoga styles & other courses to try out combined with wellness & healthy food. No matter which Yoga level or sportive skills, everyone is welcome! In each globeseekers Snow, Outdoor and Yoga Retreat we have lovely people from around the globe joining us, creating an atmosphere where we can learn from each other & grow together. Feed your body, mind & soul with our diverse weekly program and enjoy the amazing wellness area in the accommodation. Accommodation in the Mountain & Soul, a Lifestyle Hotel with a Tyrolean touch, with a Sun & Yoga terrace, beautiful garden, hanging chairs, slack line & fireplace. There is a lovely spa area with a steam room, normal sauna with view and a tyrolian "Zirbensauna". The relaxation area has a panoramic view over the mountains. When it's too cold we do Yoga in the Spa Area. Globeseekers will show you the most beautiful spots and combine the active and relaxing program perfectly with the different yoga classes. You will have daily yoga classes, courses, different daily outdoor activities, wellness and healthy meals. 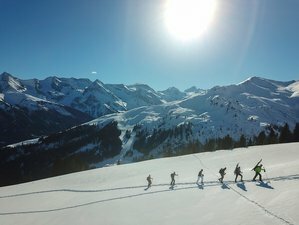 On different days during the retreat, you will integrate special activities like snowshoe hiking with a mountain guide (or splitboarding/skitouring depending on level of experience), a bonfire with guitar music, yoga philosophy, as well as an introduction to health coaching, AcroYoga, also known as partner yoga and more. You will have access to the wellness area with different saunas, steam room and a relaxation with a breathtaking view. Enjoy Outdoor sports like hiking up to a cozy hut, rafting or tobogganing and relax with guided meditations and Thai Yoga Massage. In Ashtanga Vinyasa Yoga we are engaging our muscles, training flexibility, core strength, balance & breathing techniques. We strengthen our core muscles, which is great for practicing all outdoor sports and we also learn to focus and quite our mind. In Yin Yoga we hold a posture without muscle tension for a long time period (3-5 min) to access the deeper tissue and fascia that surrounds and runs through our muscles, joints, bones and cells and keeps everything together. Anatomically, different body parts are connected through “fascial trains” which correlate with the meridians, or energy pathways, used in Traditional Chinese Medicine for thousands of years. If the flow of energy gets blocked by different emotional experiences, habits or constant stress, your body tightens and your vitality depletes. Acro Yoga is about playing, communicating & learning to trust and let go, surprising yourself and sharing laughs, when getting into the different roles. In Thai Yoga Massage we are able to get deep into energy lines & tension, practicing, feeling and understanding the body & connections in a very practical way. In Yoga Philosophy & Health Coaching we give an intro into Yoga Philosophy first, talking through different topics from the Yoga Sutras like self observation or sense withdrawal and then combine that with exercises on topics like your balance in life, learning and growing with each other in the group talks. When practicing Mindfulness we just notice what comes up in our mind or our body. Instead of engaging the thoughts and feelings creating a story in our head, we let everything come and go effortlessly and surrender. Drawing the attention inward with breathing, feeling and scanning the body we become aware. It is a beautiful way to understand yourself better, dropping back from our thinking mind into the present experience. Enjoy this perfect mix of courses and activities combined with healthy food and wellness to leave with new energy & inspiration. Denise is a Yoga Alliance certified Ashtanga Vinyasa and Yin Yoga teacher. She has been teaching Yoga around the world for the past years and together with Chris built up their idea and passion to share with others through globeseekers. She is also a certified health coach, incorporating her knowledge and passion during the retreats in the areas nutrition, healthy cooking but also balance & mental health, looking at your individual balance in life, learning and growing with each other in group talks during Yoga Philosophy and Health Coaching. Chris is a Yoga Alliance certified Ashtanga Vinyasa and Yin Yoga teacher and Thai Yoga Massage Therapist. Being born in Austria, the mountains are his playground. He loves nature and outdoor sports, snowboarding, hiking, climbing, bouldering and surfing. The self-practice and sharing different Yoga Styles and Acro Yoga, combined with mindfulness and healthy eating are important to him. With globeseekers he’s able to share his passions with people from around the globe. As unique memories for the participants he is creating video- and photo material during the retreats. This retreat will take place in beautiful Ramsau, Tyrol, Austria, with a view towards the mountains and the valley. We prepare healthy, yummy meals for you. As a health coach Denise & Chris will also give you recipes in a folder to take home with. We have lots of good stuff like fresh vegetables, salads and use mountain cheese and much more deli from the region. Breakfast consists of oatmeal, homemade wholegrain bread, veggie spreads, nuts, fruit salad, yogurt, honey, eggs, cheese, coffee and tea. In the summer we visit our friend Jack's Organic Permaculture Farm, where we pick and buy fresh veggies. He gives us a tour about growing and what different herbs can be used for and lets us try a lot. For lunch we pack a lunch package since we are outside most of the time. The dinners are healthy, yummy and organice, we enjoy them with a view into the mountains. The hotel offers a lovely spa area with a steam room, normal sauna with view and a tyrolian "Zirbensauna". The relaxation area has a panoramic view over the mountains. When it's raining we do Yoga in the Spa Area. There is free juice and tea in the spa area and free bathrobes for the spa. You will also do a Thai massage introduction with the group, and you can book healing massages, Ayurvedic massages, or kinesiology treatments. Globeseekers folder with exercises, recipes & more plus a membership in the globeseekers Community. Please book your flight to arrive at Innsbruck Airport (INN). You can take a train to Mayrhofen from Munich or Innsbruck. Globeseekers can pick you up at the train station. globeseekers journeys are more than just a yoga retreat. Join us on a deep dive towards presence, ease and conscious living in breathtaking nature!